Apple announced the iOS 9 release date during its press conference today, and it'll be available for download on September 16, just a week ahead of the iPhone 6S and iPhone 6S Plus launch. 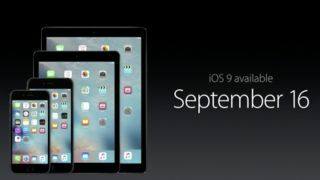 You can download iOS 9 on Wednesday, September 16, one week from today. Or you can install the new operating system right now, as it's currently in beta. That means, even if you're upgrading to the two new iPhones, you can play with Apple's new software mere days before the new devices launch in stores. Thankfully, iOS 9 is free to download and the update works with all devices that currently run iOS 8. That means devices as new as the iPad 2 to the oldie iPhone 4S can install it too. Follow our Apple iPhone 6S launch live blog!